Do you own or manage a commercial kitchen? Then you know that you always have to been on top of all the government rules and regulations so your staff and equipment stay safe. 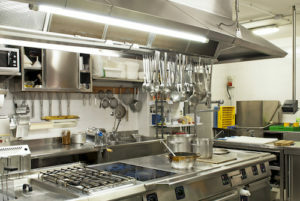 One essential way to keep your commercial kitchen compliant with the laws is to enlist the expertise of Flue Steam. We’ll make sure your automatic fire suppressions are always in good working order and always in compliance with all local, state, and federal laws. Commercial kitchens always must have automatic fire suppression systems in good working order to maintain the safety of employees, patrons, and to protect equipment from fire damage. Commercial automatic fire suppression systems are specially designed to detect and extinguish grease fires before they can spread into the ventilation system. If a fire is allowed to spread into the ventilation system, significant damage can result, and you may endanger your customers and employees’ safety. As a result, all commercial cooking appliances that could produce greasy vapors much have their own fire suppression nozzle. Even if cooking appliances are side-by-side, each one should have its own fire suppression nozzle. Each nozzle sprays an extinguishing agent and has an automatic shutoff for the electrical power and/or gas for the appliance. The system also has visible and audible alarms that provide warnings when the system has been activated so people can clear the area. A separate warning tone should begin when the extinguishing agent is actually released as well. In addition to these components, automatic fire suppression systems include a manual activation device, which is located 10-20 feet from the exhaust system, close to an exit. Worried about keeping up with your automatic fire suppression systems? It’s clear that automatic fire suppression systems are essential for the safety of your commercial kitchen, and keeping them in proper working order should be a top priority. But as an owner or manager of a commercial kitchen, you already have so many pressing tasks on your mind on a daily basis. That’s why you should enlist the expertise of Flue Steam. 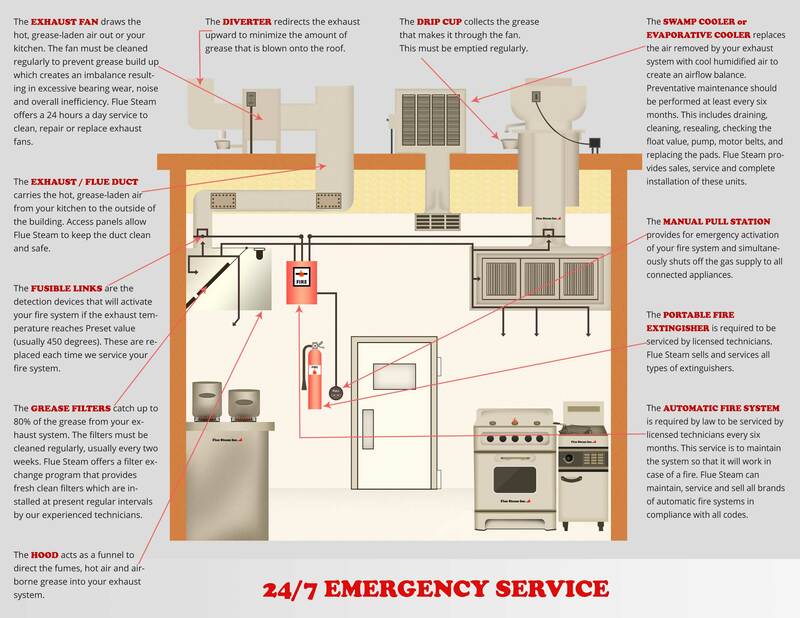 We can take care of all your automatic fire suppression systems needs in your commercial kitchen. We’re a certified contractor that’s been serving Southern California for over 48 years. We’ll take care of all of the little details involved in complying with UL 300 and California state codes. We have the C-16 license required by the state to install, service, and inspect these automatic fire suppression systems. Like any safety system, it’s important to have your automatic fire suppression systems inspected on a regular basis. The state of California requires 2 inspections per year – one every six months – as well as every system discharge. Flue Steam can handle these inspections as well as all the necessary paperwork needed to comply with all necessary laws and to provide your insurance company with proof that your automatic fire suppression systems are in good working condition. Call Flue Steam at 800-700-FLUE to start working with us today!